The Grantland Q&A: Robert Downey Jr.
Floyd Mayweather Jr. has bobbed, weaved, and danced through domestic violence accusations for much of his career. On the verge of the biggest fight in recent history, can we separate the athlete from the abuser? They say when you get hit and hurt bad you see black lights — the black lights of unconsciousness. But I don’t know nothing about that. It’s an old, simple distinction, so easy to slip into that it’s easy to dismiss: intellect or impulse, brains or brawn, calculation or passion, reason or emotion, the universal or the personal, boxing or fighting. But it’s hard not to see it when you’re watching Floyd Mayweather Jr.: He is a boxer, not a fighter. Fighting implies a struggle, overwhelming aggression — some desire, some wild need, to transfer a hurt from within onto something in the world. Boxing is different. It carries within it the first definition of the word. It suggests geometry — lines and angles — and containment. Look at him. Watch him while he measures his opponents, taking their length and width and height. Once he has made his calculations, he gets to work. It’s said that the physics of boxing are simple: All other things being equal, the bigger body usually wins. But with Mayweather, equality is hard to come by. He’s not a mauler, not a bruiser; he is quicker and smarter. More complex physical laws come into play: the dynamic mechanics of motion, the thermodynamics of the mind. He is always balanced, as comfortable and controlled in a clinch or the corner as in the center of the ring. You could see what kind of boxer he would be from the start, from the time he fought his first world title fight, against Genaro Hernandez in 1998. You could see it in the way he carried himself, in his preternatural patience, a floating stillness — even though he never stopped moving. He ducked and dipped, curled right and left, darted in and out, dropped his hands and raised them. Sometimes he’d stretch his right arm out with a kind of quiet intention, not jabbing so much as measuring the distance. By the end of the fight, he was in control; he could set his feet and throw. But what stands out now is what happened in the middle rounds, when Mayweather started holding himself the way a snake holds its head, at once coiling and recoiling, simultaneously defensive and ready to strike. He would throw that lethal lead right and simultaneously disappear from Hernandez’s line of sight. The first documented claim of domestic violence occurred in 2001. After Mayweather and Melissa Brim, the mother of his daughter Ayanna, got into an argument over child support, according to court documents, Mayweather swung open a car door that slammed her in the head, then he punched her three times in the face, leaving “fresh bruises.” Brim called the police from a convenience store. A few months after that, according to a lawsuit that Brim later filed, Brim and Mayweather were at a mall together with their daughter when Mayweather, after asking a friend to hold Ayanna, punched Brim in the neck. Brim dropped the lawsuit, but Mayweather would plead guilty to two counts of domestic battery against Brim, for which he would receive a suspended six-month jail sentence, a $3,000 fine, 48 hours of community service, and two days of house arrest. It’s hard not to be a little cynical about the commonplace way stories refer to Mayweather as a very bad man — as greedy, arrogant, disrespectful toward women. It’s hard not to see it as a quick acknowledgment that lets them get back to the business at hand, as a way of bracketing the badness to marvel at the greatness — or at least the richness — of the man. And it’s also hard not to be a little cynical about the periodic waves of outrage, the stories that review the horrifying details of his alleged serial abuse of women and call for his fights to be boycotted or his license to be suspended. It’s hard not to think, We know this already. Welcome to sports in 2015. Welcome to the world. Rarely does either kind of story about Mayweather involve the other. It’s the boxer or the batterer. On Saturday, Mayweather will take on Manny Pacquiao in a fight that has quickly become the biggest, most important event in recent boxing history. What’s so striking to me isn’t the spectacle of it but the dissonance around it. A sport that is increasingly marginal is dominating SportsCenter. A fight in a stadium that holds only 16,800 and is available only on pay-per-view could generate $300 million. A boxer who wins like a dancer allegedly beats women like a pugilist. In the ring, Mayweather contradicts the image of the fighter as dangerous, unconstrained, communicating the promise of violence. Fighters are supposed to be the avatars of the atavistic in men’s nature. They are warriors, they are outlaws. They drive their savage fists through centuries of civilized restraint. Mayweather, on the other hand, seems less like a raw gladiator than a polished Greek statue, carved from the marble of antiquity, with all the classicism that implies. Wisdom, courage, moderation, justice: the four virtues of Plato, four qualities of Mayweather’s boxing. He could be smart, he could take chances, he could exercise restraint, and he could win only because he could not be touched. From the start, he was elusive. Bruisers known for Picasso-ing faces found they could barely hit his. In 2001, a month before allegedly punching Brim, Mayweather faced Diego Corrales, a fierce brawler known for his knockout force. Corrales came into the ring as the favorite. He left it humiliated. For Corrales, it must have been like trying to make contact with a ghost. In no round did Corrales land even 10 punches. In the seventh, he connected on only three of five punches. Mayweather threw 50 and landed 39. Corrales was so totally beaten near the end that he barely pretended to box. His will was so broken that he almost gave up. In 2003, Mayweather was at a nightclub at the Luxor in Las Vegas when he spotted Herneatha McGill and Karra Blackburn, two friends of Josie Harris, who was the mother of three of his children. According to the testimony of McGill and Blackburn, Mayweather hit them both and then followed them out of the club when they fled. Outside, he allegedly picked up and shook a female security guard; police issued him a citation. The security guards at the casino encouraged the women not to press charges and thus risk “paying for it in the streets,” but McGill and Blackburn eventually filed a complaint, and Mayweather went to trial. He was found guilty of two counts of battery and, for each, given suspended prison sentences and a $500 fine or 50 hours of community service. He was also ordered to receive “impulse control” counseling. According to a Deadspin story, the case was vacated two years later and the charges would ultimately be dismissed. 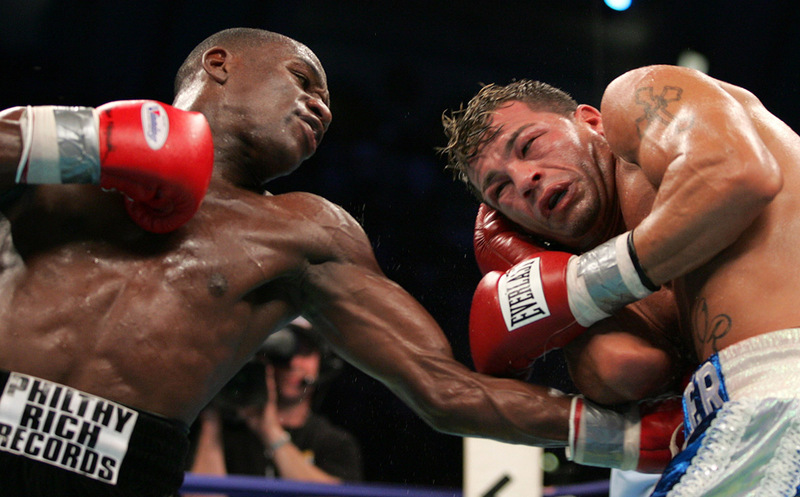 On June 25, 2005, Mayweather faced Arturo Gatti in Atlantic City for the super-lightweight title. Gatti was the crowd favorite, a heart-bearing fighter who swung for a knockout with every punch. But Mayweather was the heavy favorite, acknowledged by many as the world’s best pound-for-pound boxer, and against Gatti he proved why. The ease with which Mayweather defeated Gatti was expected, but the sight of it was still shocking. The victory had a kind of inexorable quality. Mayweather was always in control, as cool and fluid as a steady stream and just as hard to hurt. If he was on the ropes, it was probably because he let himself be led there. Gatti flailed; Mayweather couldn’t miss. By the final round, he was using long combinations that Gatti didn’t even try to counter. Gatti moved like the air was a little thick. He advertised his effort. He swung with a desperate kind of passion. The way Mayweather dismantled him was matter-of-fact. Mayweather’s punches were powerful and unrelenting, but there was no blunt brutality. They were almost pretty, they were so precise. Mayweather showed no palpable rage, hardly even a desire to inflict pain. The vicious force of his fists was obvious not as much in his actions as in the effects. Welts seemed to bloom on Gatti’s face almost of their own accord. Eventually, his eyes began to swell shut. It was like watching a bear be felled by a swarm of bees. A month after beating Gatti, Mayweather went to trial on a felony battery charge. The previous year, Josie Harris had angrily confronted Mayweather about another woman. In response, Harris told police, he repeatedly punched her, kicked her, and dragged her by her hair, cutting her face. “My babies’ father just beat me up,” she said when she called 911. But at the trial, Harris backtracked. Yes, there had been a fight, but she claimed that she had provoked it. She had been jealous. She had been drunk and had taken half a pill of ecstasy. That facial laceration? Mayweather had been restraining her. She had been “pulling on him, punching on him, telling him he was wrong for what he did to me.” Mayweather, she said, wouldn’t try to beat her. He was found not guilty. Mayweather’s relationship with Harris was on and off for years. Even when they were not together, she lived in one of his houses. For a time, she wore his 25-carat diamond ring. Over the next decade, Mayweather built his career carefully, choosing his opponents and picking his spots. He was forever self-contained, in control. Some people found his way of winning boring, and even contrary to the spirit of prizefighting. He chased points instead of knockouts. He wasn’t the only boxer who found success with a defensive style. Pernell Whitaker, Willie Pep, Andre Ward — there were other boxers who had won by not losing. But Mayweather was the best at it. He drained the blood from a fight. Instead of aggression, he offered mastery. Instead of the thrill of violence, banality. Instead of fighting, boxing. He had opponents who roughed him up, of course. Jose Luis Castillo stifled him so well that the result of their first fight was in dispute. Shane Mosley knocked him so hard in the second round that Mayweather’s head snapped back and and his knees started to tremble. Miguel Cotto bloodied his nose. Marcos Maidana hammered him with wild, sloppy punches, desperately but effectively. But in every instance, whether by the end of the fight or in a rematch, Mayweather had so thoroughly mastered his opponents’ weaknesses that his dominance was never in doubt. At some point, always, his opponents’ movements turned blurry. Their force became passion. They hammered and bludgeoned the air. But Mayweather had a javelin of a straight right. When he let it fly, it would shoot through the smallest of unguarded spaces. Even as it landed, he was already setting up another, or dropping and dipping and ducking away as he anticipated the counter. And it was brilliant, efficient, and unelectrifying. He boxed like his aim wasn’t to punch his opponent’s lights out, but simply to find the switch and flick it off. Boxing has always been riven with contradictions. It was, from the start, a gentleman’s sport and also a desperate man’s. It was a mark of nobility and also of scum. For more than 100 years, West Point cadets have had to learn boxing. And for more than 100 years, fights have been the place to find the high and low. They were occasions for glamour — for furs and tuxes, for Toots Shor’s and Muhammad Ali — and also for Mob ties, hush money, and a long string of sad stories about boxers whose lives were chewed up. Even in its heyday, boxing was a fun-house mirror for society, exaggerating the best and worst in men. Joe Louis, Ike Williams, Sonny Liston — the list of fighters who lived broken lives and broke others could go on and on. Even the beloved Gatti was arrested on domestic violence charges and died in strange and violent circumstances. Boxing offered a ritualistic release of violence in the ring, and it wasn’t a surprise when the blood splattered beyond it. There were boxers with rap sheets who were loved — guys like Corrales and Gatti, celebrated for their heart and their grit. But Mayweather was suspect. His clinical style had a way of deadening the crowd. So he turned himself into an antihero to get attention. If he couldn’t be loved, at least he’d be rich. Mayweather comes from a boxing family. His father was a welterweight who fought Sugar Ray Leonard. His uncle won two world championships. His father went to prison for selling drugs, and his mother was an addict. The convoluted drama in the Mayweather family — the accusations, betrayals, reconciliations, recriminations — is legendary, as messy as Mayweather’s fights are neat. Mayweather capitalized on it. Before his 2007 fight against Oscar De La Hoya, De La Hoya and Mayweather did a promotional reality show, HBO’s 24/7. 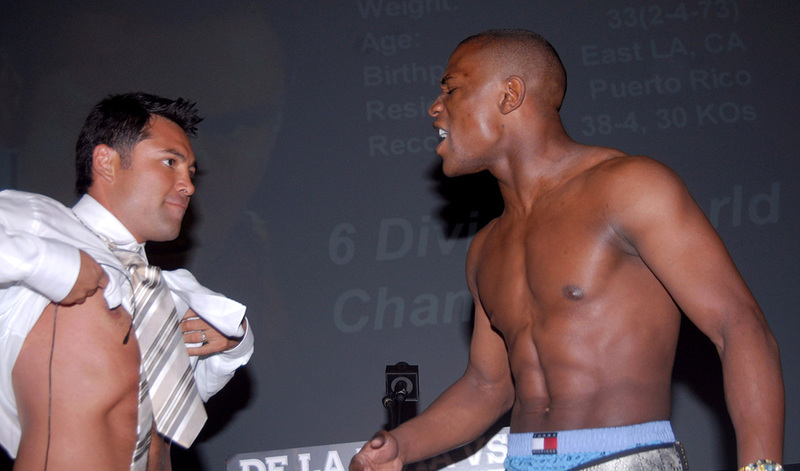 De La Hoya was the big draw back then, though not the favorite in the ring. Mayweather turned himself into the Golden Boy’s antithesis. He sold himself as brash, eccentric, antic, charming, irresponsible, irrepressible. And it worked, sort of. The fight, which Mayweather won by a split decision, generated a record-breaking $130 million–plus in revenue. Soon after, “Pretty Boy Floyd” became “Money Mayweather,” the inheritor of the legacies of Liston and Tyson. He bought cars. He kept winning. He kept making money. And pretty much everyone connected to boxing, directly or indirectly, kept making money off him. Early in the morning on September 9, 2010, Mayweather showed up at his ex-girlfriend Josie Harris’s home — a house that he owned — and confronted her about whether she was dating the NBA player C.J. Watson. (Mayweather, in fact, was living with his own girlfriend at the time, Shantel Jackson.) After Harris and Mayweather fought verbally, Harris called the police and said that while there had been no physical abuse, she wanted Mayweather to go. Mayweather agreed to leave, but he returned around 5 a.m. and was let inside by one of his kids. Harris was awakened by the sound of Mayweather screaming at her about text messages from Watson that he had seen on her phone. When Harris admitted they were dating, Mayweather flew into a wild rage. 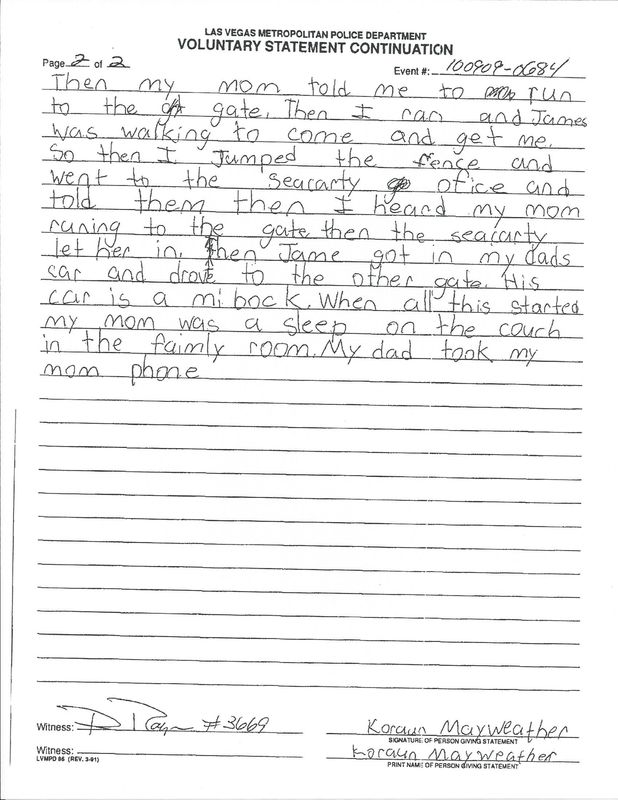 According to Harris’s statement, to the handwritten testimony of his children, and to the subsequent doctor’s report, Mayweather punched her on the top of and in the back of the head. He allegedly kicked her, pulled her hair, and tried to break her left arm. “I’m going to get someone to pour acid on you,” he also said, according to the police report. Zion, their 9-year-old son, gave police a voluntary statement about what he saw: “He was punching her and kicking her. He was punching her in the head and he was stomping on her sholder [sic].” When Harris yelled for the children to call the police, Mayweather threatened them with violence if they did, and a friend who had come with him blocked the way, according to police. But Zion’s brother Koraun escaped, “jumped the fence,” and made his way to the main security gate, where he told the guard to call the police and an ambulance. A doctor’s examination of Harris afterward showed bruises and a concussion. Mayweather pleaded guilty to misdemeanor domestic assault and harassment charges, and he spent two months in prison. The plea bargain let him avoid charges that could have led to up to 34 years in jail. Harris declined to testify against him in 2011, but she has begun to speak openly about the incident. The judge did give Mayweather one break: She agreed to delay his prison term so that he could fight Miguel Cotto, apparently swayed by arguments that the fight was a financial boon for Las Vegas. The contest looked close until Mayweather ran away with the victory in the final rounds, toying with his opponent as he dodged Cotto’s swings and landed, almost at will, those brilliant right-hand leads. The bigger victory for Mayweather, though, was already in the bank: With that fight, he broke the Nevada record for a guaranteed purse. Before he even stepped into the ring, Mayweather was assured to walk away with at least $32 million. That number seems small now. The bout on Saturday is expected to shatter payday records. According to Pacquiao’s promoter, the live gate receipts will reach $74 million — $54 million more than the previous record. 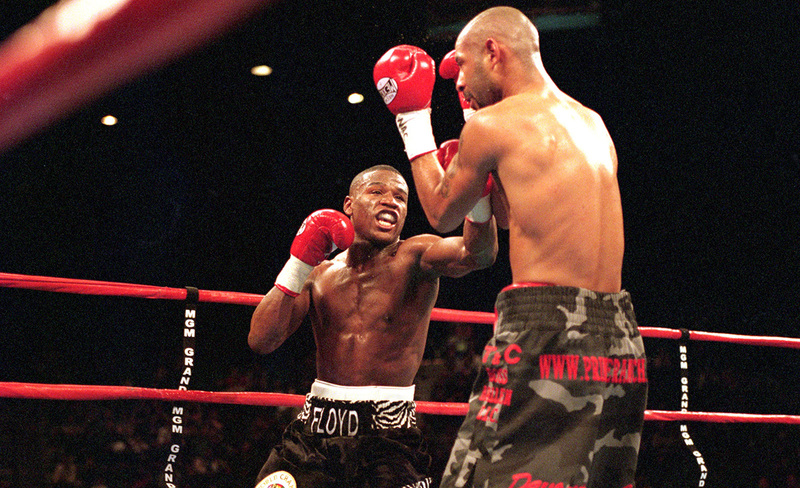 Pay-per-view buys are estimated to easily exceed the current high set by the Mayweather–De La Hoya fight. The New York Times estimated that the revenue may be around $300 million. With a 60-40 split, Mayweather could make well over $100 million. And this is icing. He is already the highest-paid athlete in the world. Mayweather responded to Jackson’s allegations by posting pictures of a fetus on Facebook, which he claimed she aborted. I can’t, of course, say what’s behind Mayweather’s serial abuse — physical, verbal, or emotional — of women. Men who are rich beat women; men who are poor do, too. They do it in Alaska and South Carolina, in New York and Oslo and Dubai. They do it when they get away with it, and they do it when they don’t. Every day, an average of three women in the United States are killed by a current or former lover. But the more I watched Mayweather fight, and the more I read about his allegedly violent acts outside the ring, the more I began to see it as all of one piece. The circus that follows him. The bag filled with cash and gambling slips. The entourage. The houses and the women installed in them, the diamond rings as collars. The way he takes the measure of a situation in the ring, determining when it’s safe to punch and when to duck. In stories about Mayweather, distinctions start to seem beside the point or even banal. Cars, women, greed, domestic violence, private jets, family drama — they’re all presented as part of the same lurid carnival. This, after all, is what Mayweather does: He treats everything like money, and a dollar is a dollar. The dollars drown so much else out. There are hundreds of millions of dollars at stake in this May 2 fight — and not only for Mayweather and Pacquiao. Money for the promoters, the sponsors, Las Vegas, Nevada, gamblers, TV. It is almost impossible to disentangle. The web includes, after all, ESPN, Grantland, and me — even this story. But it isn’t only the money that protects him. It’s the unsettling compromise of modern life. What Mayweather does in the ring is special. He is the rare kind of athlete who, if you watch him closely enough, can help you see the human mind and body a little differently. And what Mayweather does outside the ring is reprehensible. What do you do with this? I don’t know. You can focus on the boxer or focus on the batterer. Or you can keep the two in stereo. With or without resolution, we can talk about it. Perhaps Mayweather has just made the most basic calculation of all. Money Mayweather can beat women because it costs him very little. He hasn’t really been hit. The black lights of the unconscious? He’s never seen them. This piece has been updated to correct the location of the 2005 Mayweather-Gatti super-lightweight title fight; it was in Atlantic City, not Las Vegas. There have been other claims of battery for which the police were not called.